Product prices and availability are accurate as of 2019-04-22 07:40:35 EDT and are subject to change. Any price and availability information displayed on http://www.amazon.com/ at the time of purchase will apply to the purchase of this product. Baby Foot is designed to remove the unsightly, dead skin cells on your feet that build up over time and can contribute to numerous problems associated with the soles of your feet. Dead skin cells accumulate due to pressure and friction from ordinary activities such as standing, exercising, and wearing shoes. In many cases, feet become cracked and painful from the accumulation of dead skin. In the past, frequent use of foot files and razors were used to "remove" the dead skin on your feet. However, this was a temporary fix because as we now know from recent research, filing generates more friction to the soles of your feet which in turn creates more dead skin. No more filing with the use of our Baby Foot product. Baby Foot is an unparalleled, total foot care package that provides you with the opportunity to care for and maintain your feet at home. Our scientifically formulated product contains 17 types of natural extracts which exfoliate and moisturize at the same time. The principal ingredient of Baby Foot is fruit acid which is very gentle, when compared with other acids. The fruit acid penetrates into the layers of dead skin cells and breaks down the desmosomes which hold the layers together. By this process, skin is undamaged but peels easily away from the fresh layer beneath. After peeling, your feet are reborn just like a baby's foot, giving you healthy, beautiful feet. 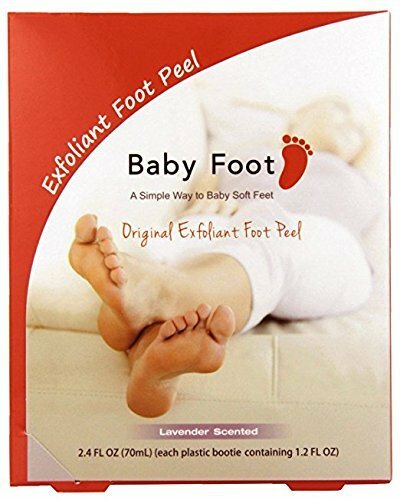 Baby Foot contains 17 kinds of natural extracts which have a high moisturizing power and astringency, thus the sole becomes smooth after peeling. Baby Foot not only peels the dead skin cells from your feet, it also maintains the grain of the skin and adds moisture to the skin. Remove the unsightly, dead skin cells Restore softness to callused feet and fight fungus and foot odor Keep skin of the feet healthy, happy, and trouble-free!